Two goals in the opening 16 minutes for Nottingham Forest ensured MK Dons would leave the City Ground pointless as they went down fighting in a 2-1 defeat. Defensive horror shows allowed Nelson Oliveira to open the scoring after just two minutes before yet another gifted a second to Ryan Mendes 14 minutes later. Chasing the game, Dons could have been further behind as Oliveira hit the post and Henry Lansbury made David Martin reach to save. But it all came to life for the visitors ironically after Nicky Maynard missed a penalty as Josh Murphy pulled one back to give Dons a new lease of life for the remaining 13 minutes, but it was too little too late as Dons tumbled to 21st in the table in their last game before Christmas. MK Dons’ only win on the road prior to kick off was the 4-1 win on opening day against Rotherham, and Karl Robinson made just one change to the side which started at the New York Stadium that day. Nicky Maynard led the line ahead of a narrow Dean Bowditch, Ben Reeves and Rob Hall combination - Sam Gallagher was the only man missing from the opening day line-up. 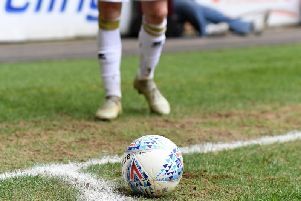 Dons came into the game on a real high, having got their just rewards in a 2-1 win over Sheffield Wednesday in midweek, but were immediately behind at the City Ground. Caught upfield in an early attack, Dean Lewington left a gaping hole down the Dons left as Ryan Mendes was allowed to break forwards. Somehow missed by Antony Kay, Nelson Oliveira got in behind cut back inside to lose make-shift marker Samir Carruthers and rasped a drive across David Martin and into the far corner of the goal to give Forest a second minute lead. Dons though settled nicely into the game, despite trailing. Quick to get their passing game going, they were nearly rewarded with an equaliser, but Rob Hall’s 25 yard free kick was expertly saved by the diving Dorus De Vries in the Forest net. But the task was made doubly difficult on 16 minutes when a routine Daniel Pinillos cross was left by David Martin and Lewington, allowing Mendes to not only take a touch, but poke it into the net as both just watched on. And it should have been three barely two minutes later when more indecisive stuff at the back allowed Oliveira one-on-one with Martin, but his effort grazed the outside of the net rather than put the game definitively to bed. Forest could afford to let off the gas for the rest of the half, allowing Dons to take the lionshare of possession. But for their narrower shape, the visitors were simply unable to create anything. Hall was the most lively outlet for Dons, but hardly saw the ball, while Ben Reeves and Dean Bowditch struggled to keep the ball. Maynard was given a chasing brief, and despite some strong hold-up play, wasn’t able to do it alone. It meant Forest were given a comfortable time into the interval. Dons hardly did themselves any favours in falling behind, but similarly, Bowditch had to do better when presented with a rare opening in front of goal. Hall’s low ball into the mixer evaded everyone until it reached Bowditch at the far post, but seemingly caught by surprise, his right footed strike was weak and while it made De Vries get down low to keep it out, it had to be better. At the other end, Martin had to be at full stretch to prevent Forest from killing the game off on the hour mark as Henri Lansbury bent a fine free kick around the wall with the ball destined for the bottom left corner. There was little the keeper could have done about Oliveira’s 25-yard effort five minutes later, though it skipped off the surface and back off the upright as Forest continued to flex their muscle, as if just to prove a point. It was turning out to be one of those days for Dons, and it was perfectly summed up when substitute Josh Murphy was bundled to the ground in the area by Eric Lichaj, but Maynard’s penalty was at the perfect height for De Vries to dive to his right and punch it clear. They did pull one back though with 10 minutes to go, this time Murphy evading his man to get on the end of Lewington’s pass from just inside the box, giving De Vries no chance and halving the deficit. It gave Dons the chance then in the remaining 10 minutes to pile forwards and seek an unlikely equaliser. For long periods Forest simply couldn’t get out of their half and certainly couldn’t clear beyond half way as everyone bar Martin set up shop in the Forest end. With ball after ball sent into the mixer, the Forest defence were under pressure but managed to ride the storm.